Who you gonna call? The Pawn Stars! The guys remember the 80's as they check out a replica of the proton pack from "Ghostbusters." Will they give this item a ghost of a chance? Then, a seller brings in an original work by the street artist Banksy. 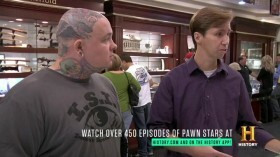 Can Chumlee convince the Old Man that street art is valuable? And later, Rick and Corey take their 1951 "Steve McQueen" Chevy to an auction. But when Corey sees a classic Plymouth Roadrunner, will he spend a king's ransom to buy his dream car?